Twin wall insulated multi-fuel system chimney. Therminox is a high quality, multi-fuel, stainless steel twin wall system chimney designed for use with all solid fuel, wood, coal, gas, oil and pellet heating appliances. It is ideally suited for operating temperature up to 450°C and comes with a 10 year Axa backed guarantee. The Therminox system chimney is available as TI with a bright stainless steel outer case, and ZIoffering better value for internal use. Also, it can be powder painted to any RAL colour of your choice or can be ordered with a copper outer case. It comes with a wide range engineers components making the installation of the chimney even much easier than usual. With Joint Seals, Therminox can also be used under positive pressure when connected to a condensing boiler. Designation: T450 N1 W V2 L50040 G50 – T250 N1 W V2 L500040 O20 – T200 P1 W V2 L50040 020 (with Joint Seals). Wide range of accessories i.e. Lengths, Elbows, Tees, brackets & supports. Solid fire-stop plate at ceiling level tested and approved. Insulation: High pressure injected mineral wool 30mm thick. Lateral (wall bracket) every 4 metres. Deadweight (wall support) every 16 metres. Easy to install: Simple push fit joints secured with quick action toggle clip Locking Band, wide range of quality engineered support components with exceptional ability to adjust to suit the building fabric. Joints between chimney sections and associated locking bands shall not occur within any ceiling joist space or wall/partitions. Fire-stops or Fire-stop/spacers shall be fitted to the frame formed between compartments through which the chimney passes. The lower end of the chimney shall extend at least 150 mm below a non-combustible ceiling, but the required clearance distance from combustibles to the connecting flue pipe must also be respected, usually three times the diameter of the connecting flue pipe eg. 150 dia. pipe = 450mm clearance to combustible. Where the flue pipe connects to the chimney the connection shall be made using our Pipe Connection Length (EDP) or using our P Adaptor which can be supplied with any spigot diameter so suit. Therminox has exceptional thermal properties that guarantee a true 50mm clearance to combustible materials. The chimney system shall have no more than 4 bends in total. 2 bends in the chimney and 2 bends in the flue pipe connection. The offset shall provide a change of direction no more than 45° from the vertical. The run of chimney between bends shall not exceed 20% of the total chimney length. Where the chimney passes through a pitched roof more than 0.6m from the ridge the horizontal distance between the roof and the chimney termination shall be not less than 2.3m unless the termination is at least 0.6m above the ridge (excluding any chimney terminal). Where the discharge end of the chimney flue is within a horizontal distance of 2.3m from any adjoining structure or opening into building the termination height shall be not than 1m above that structure or opening. 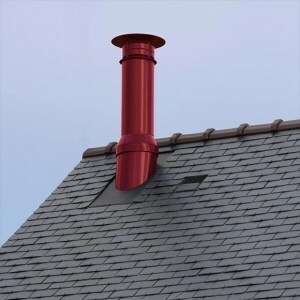 Where the chimney passes through a flat roof or a shallow pitched roof having a slope less than 10°, the chimney termination shall be 1m above the level of the roof at the point of penetration through the structure.